Culture Amp recently launched its first employee wellbeing guide to encourage Campers to look after their physical and mental health, knowing they have the company’s support to do so. What’s great about our guide is that it’s specific to Culture Amp’s values and people. 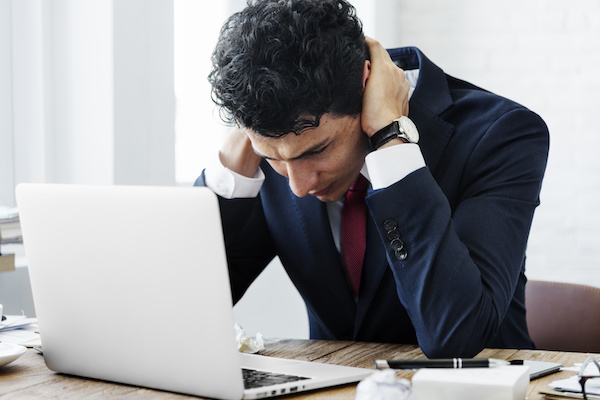 Because just as there’s more than one path to achieve employee engagement, we firmly believe there’s more than one path to achieve workplace wellbeing. That’s why we decided to put together a short, but powerful, list of existing wellbeing guides that are different from Culture Amp’s, but still inspire us. 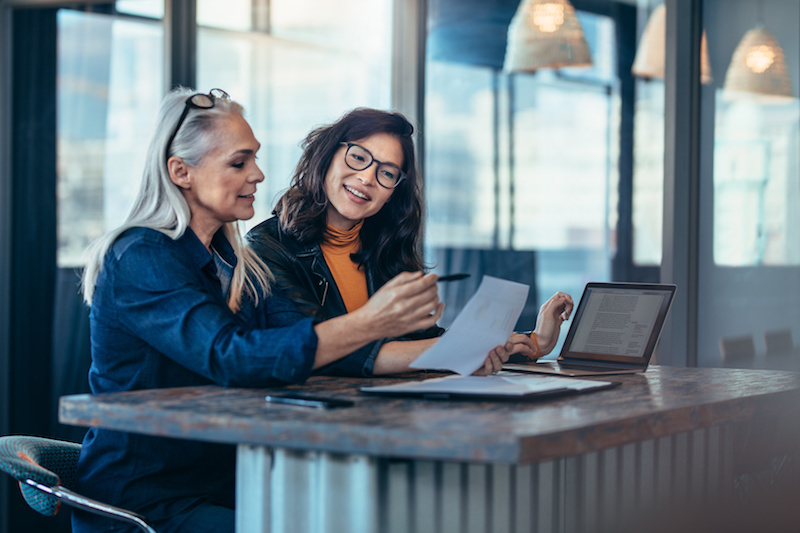 We spoke with the leaders of Bench Accounting, Silver Chef, and Collective Health to understand what motivated them to create their wellness guide, the impact it’s had on their employees, and their tips for companies who want to get started on their own guide. 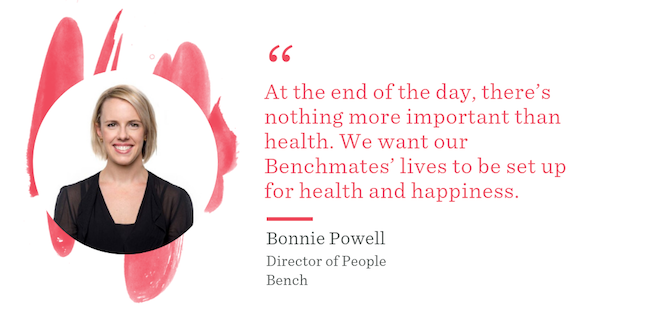 Since then, Bonnie says the company has incorporated the wellness guide into many aspects of Bench’s people-focused processes. “We integrated the guide into our new hire onboarding and Workplace Wellbeing training sessions to reflect how we think about mental health. It’s super important for our newest Benchmates to know that this resource is available, and to set the tone around how we talk about wellbeing." The company’s leadership team also took action on many of the concepts outlined in the wellness guide. As a result of these actions, Bonnie says the guide has had a huge positive impact on its employees. Which is why the company’s founders decided to share this resource with the world, with the hopes that it would produce similar results for their teams. Start a conversation to gauge interest from employees on what “wellness” and “wellbeing” means to them. Create a group of people who are passionate about wellbeing to brainstorm ideas. Get clear on your why and determine your desired outcomes. What problem are you solving? Promote ongoing initiatives that reflect a shift towards creating wellness and wellbeing. Invest in the health and happiness of your people - after all, without people, businesses really aren’t much at all. At Silver Chef, wellbeing is a core company value. 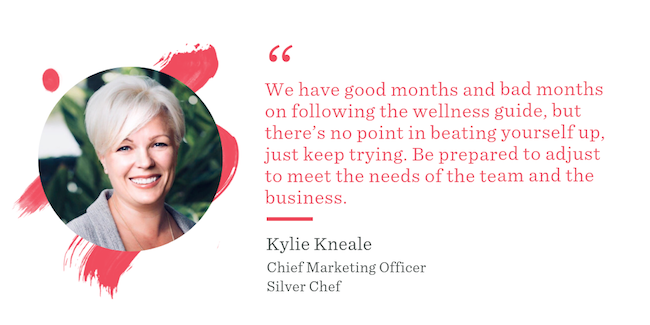 However, according to the company’s Chief Marketing Officer, Kylie Kneale, it was important to uncover exactly what wellbeing meant to Silver Chef’s employees. Based on these findings, Kylie shared the series of thoughtful steps the Silver Chef team took to develop their guide. Alignment: The first step was a Values workshop, where we discussed what each value meant to us in practice, and how we can live our values everyday. For instance, flexibility is a value that’s important to our company. For us, that meant being able to work from home as required. Agree on ways to celebrate or commiserate: We used to have junk food to celebrate and commiserate. When some people tried to implement healthy food choices, others felt it was condescending. It was important to find healthy ways to celebrate and let off steam in times of stress together as a team. Research: We researched what others were doing and spoke to our agencies; one of which was a fellow B Corp and our storytelling PR agency, MKT. They had been running a wellness program for four years and evolving the program to meet the changing needs of their people. Part of our research was testing out what types of rituals and initiatives worked, and what we felt would work in our business. Test and Learn: Whatever we did needed to be sustainable and relevant. During the test phase we found we were layering meetings on top of existing operating rhythms. A daily check in for 10 minutes worked, but we needed to be clear on the purpose. We found walking meetings was a better option for us because we had a couple of fast talkers. It slowed us all down to listen better and for the talker to reduce their pace. All of these efforts introduced some great initiatives at the company, such as Silver Chef’s beloved Wellness Wednesday Lunch, where employees take turns in pods of three to host a lunch for their team. Kylie says she’s also noticed considerable improvements in the way teams work together as well. Kylie made a point of emphasizing that consistency is more important than perfection when it comes to implementing the initiatives set out in the wellness guide. For companies who are considering starting their own wellness guides, Kylie encouraged teams to just take that initial step forward. Collective Heath’s mission is to enable its members to work well, so of course that ambition applies to its own employees too. 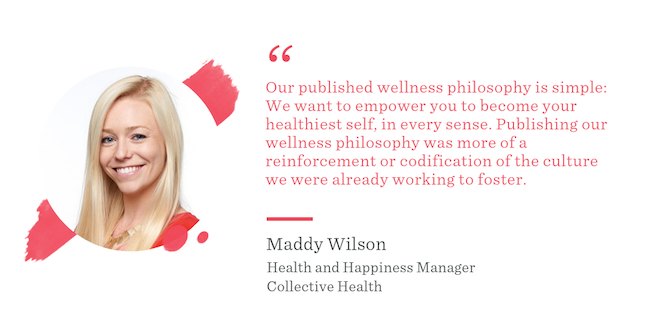 According to Maddy Wilson, the company’s Health and Happiness Manager, wellbeing has always been part of the culture at Collective Health. As the team expanded, the People Ops team defined a wellness philosophy to reflect the evolving needs of its employees, which set the tone for the guide and all its related programs, benefits, career development, and culture. 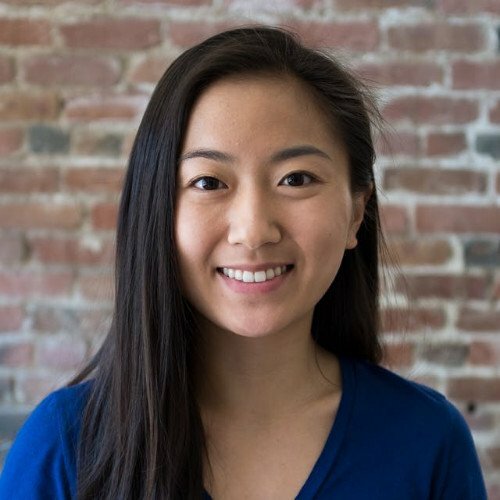 While creating a guide is an important initial step in developing a culture of wellness, Maddy believes what will truly drive success with employee wellbeing is catalyzing a movement that is grounded in a clear understanding of why employee wellbeing is a human and business imperative. It can be tricky to ensure that every part of their wellness philosophy is implemented, so Maddy emphasized the importance of leaning on the management team for support. Maddy explained that this investment in employee wellness can be challenging to capture the exact value of, but will inevitably lead to positive and noticeable results. Enlist a handful of passionate, dedicated folks to champion the vision. Wellness at Collective Health had a grassroots beginning. 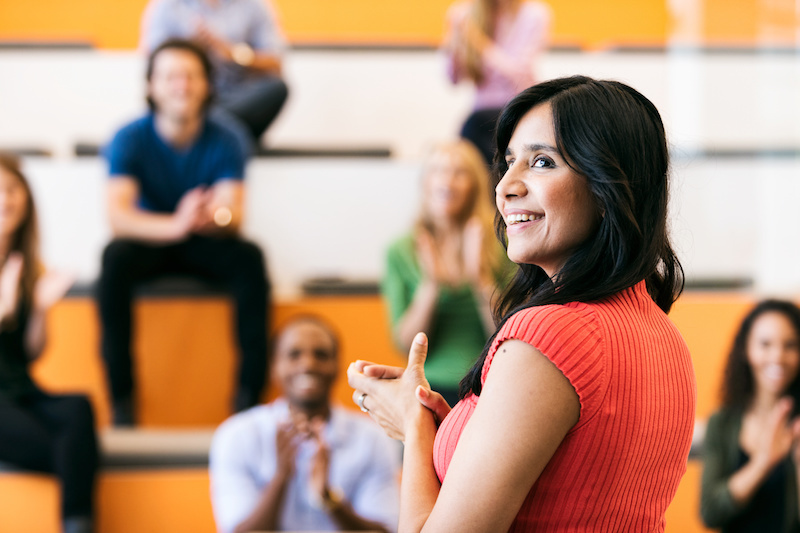 Talk to your employees about what’s important to them. Is it financial education, healthier food options at the office, more flexibility in the mornings? You can do this through survey platforms like Culture Amp, focus groups, or casual interactions with your colleagues. Help managers and leaders understand the value of employee wellbeing by including their perspectives early on in the conversation. Opportunities for engagement with your wellness movement is more than time and accessibility, it’s also the perceived sense of permission, so leadership engagement on all levels is critical. People need to feel like they can take time off, leave early to see their kid’s play, or attend the 5:30 yoga class. That feeling of support comes from relationships with managers. We’re excited to be part of and witness this growing investment in employee wellbeing. We’re grateful to Bench Accounting, Silver Chef, and Collective Health for being leaders in this movement, and for taking the time to share the inspiration, processes, and results that drove them to create a wellbeing guide. If you’re interested in learning how Culture Amp can help your company measure employee wellness initiatives, be sure to request a demo.